It's important to note that the issues described in this post aren't the only problems one can encounter with an ID card printer. However, they're among the most common. 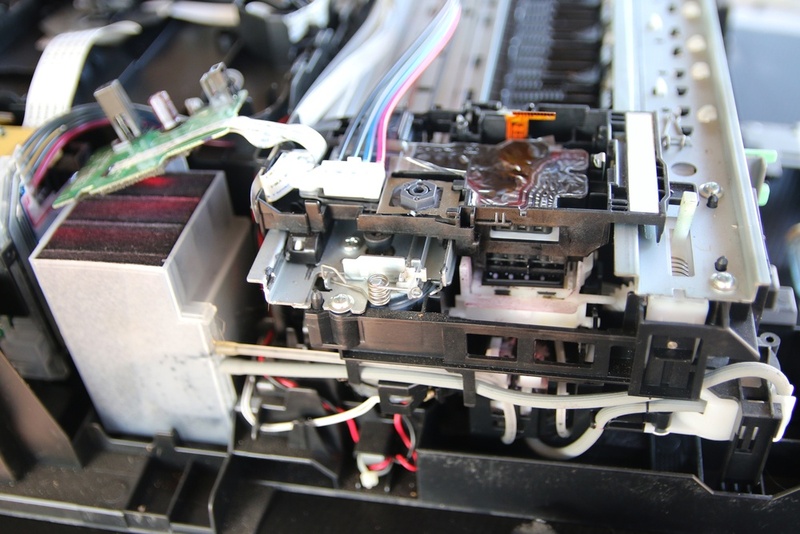 Serious printer repairs should be done by a trained professional, as messing around with the inner workings of a printer without the proper training is a great way to create even more problems. If you encounter any of the issues described in this post and aren't comfortable tackling them on your own, give our customer service team a call at 800.233.0298 and they'll help you get set up with the perfect printer service plan. 1. Why are there white lines appearing on my printed ID cards? Your test card just came out of the printer, and it looks pretty good. No smudges, the colors look sharp...wait, what's that white line? Yes, the dreaded white line is a common occurrence with ID card printers, something most people who preside over busy badging operations will encounter at one time or another. The white line issue usually appears as a vertical line running up the entire width of the card. It may look like a printed white line, but it's actually an area without any print at all: the white line is basically a bare spot on the card. 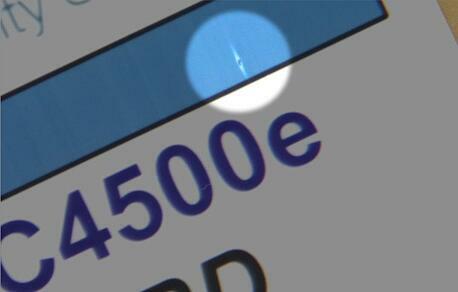 An ID card with a white line means that you have a busted pixel in your printhead. Because the pixel is broken, it's unable to print on its specific area of the card, leading to the print-free "white line" area. How do you fix a white line card printer issue? Unfortunately, a broken pixel on a printhead means the printhead will need to be replaced, so you'll have to order a new printhead. Please note that printheads are model specific and are rarely a "one size fits most" solution. It's best to check with your manufacturer to see what kind of printhead you need and to then order it from your preferred vendor. 2. Why are there imperfections or spots appearing on my printed ID cards? The easiest way to bucket all of these issues is to call them surface imperfections: small areas on your printed card where something just didn't go quite right. As the image to the right illustrates, these issues are often extremely small, but are still quite noticeable. These imperfections are caused by having dust, lint, dirt or other debris on the surface of your card when it goes through the printhead. Basically, this debris gets in the way of the printed imagery being applied to your ID card's surface. Think of the dust as being like a tiny umbrella, keeping anything above from coming into contact with anything below. The printer tries to apply the imagery as normal, but the dust gets in the way. Some surface imperfections are tiny enough to be overlooked; however, even the smallest imperfections make a printed card look a bit unprofessional (at best) or completely amateur (at worst). How do you stop bumps and spots from appearing on printed ID cards? The fix depends on where the debris is coming from: your printer or your cards themselves. How are you storing your blank cards? If cards are just lying around on a desk or in a drawer, chances are the dust is coming from the cards. Always store your cards in some kind of container, whether it's a resealable plastic bag or a box with a lid. Try cleaning off your blank card stock and storing the cards properly, then see if the issue presents itself again. If you're storing your cards properly and still having issues, your debris must be inside the printer. You can try blowing out the debris with compressed air dusters, something most offices have lying around. However, you may be better off using a cleaning card specifically designed for your printer. These sticky cards pass through your printer and pick up all of the dust and debris they encounter, including debris in places that compressed air won't find. 3. Why does my ID card printer keep jamming at the start of a job? Printers and jams: they go together like peanut butter and jelly. Whether you're using a laser printer to print your senior thesis or a photo printer to bring those vacation pictures to life, print materials are going to get stuck from time to time. It happens, and ID card printers are no exception. However, one of the common card jams encountered by users of ID card printers has a somewhat uncommon cause. 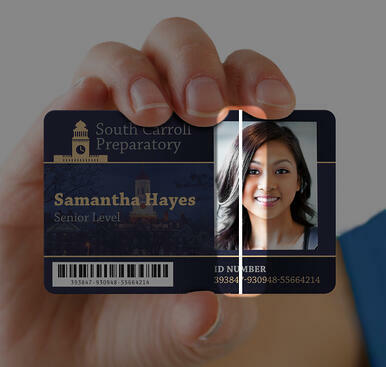 If you're using your ID card printer and find that you are getting card jams right near the input hopper or very early in the print job, you'll probably be surprised to learn that your problem is caused by a part of your printer working too well. ID card printers have rollers inside them that guide the card along through the print process, pulling it from the input hopper, passing it through the printhead, etc. These rollers are sticky by necessity: they need traction to be able to pull and push the cards along. However, the rollers being too sticky is what leads to many card jams. The rollers are so sticky that they're unable to pass the card on through the rest of the process. Instead, the card gets stuck to the rollers, causing a jam. How do you fix a jammed ID card printer? You basically want to make your sticky rollers...well, less sticky. Remove your rollers from the printer and briefly roll them on a clean surface, like a desk or table top. The goal isn't to remove all of the stickiness from the rollers, but to make them slightly less sticky. This allows the rollers to pull the cards through without the cards getting stuck. From cleaning kits and supplies to printers from respected brands, IDenticard has everything you need for a professional badging operation. Browse our online store to find what you need.